Rural France, June 1925 - The witness to the Moreau massacre, Eternal, is still incarcerated in an asylum, trapped by her amnesia. Only her true love, Edouard, can help rediscover her identity. 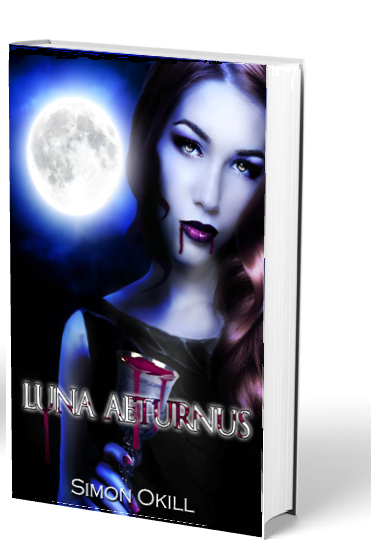 But the startling truth attracts the attention of The Count, the secret leader of a vampire cult. The Count needs Eternal’s blood to achieve his destiny at the Eternal Hour and he has the forces of evil to help him. 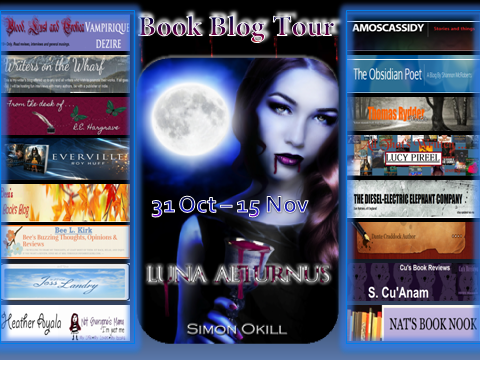 Welcome to Simon OKill's Blog Tour for Luna Aeturnus! I got a chance to get a peek into Simon's head with some of my crazy questions. I'm sure y'all will find it as entertaining as I did! Eeew sox. Vampire’s don’t wear socks. I am a vampire - I hang free. The last one in the box, I’m always the last one. Sigh! Yes as the first singing vampire. Nothing, I drink blood from the source. I don’t need shoes as I prefer going barefoot. I paint my feet black so no one notices. Black, there is no other colour. Just my cat and she tells me what to do all the time - open the door, feed me, open the door, it never ends. All my failures are other peoples’ successes. No, but I know how to drop a concrete floor onto an egg and smash it. Just as 22 isn’t pronounced twoty two. Do we have an hour or two as I am a narcissistic vampire and so perfect. Horror horror and oh, horror. I die for horror. Being so misunderstood makes me want to bite and biting calms me down. A trip to Mevagissey, Cornwall where BTW the 1977 film Dracula starring Frank Langella was filmed. If you could have a luncheon with any three people (real or fictitious/from any time period/dead or alive), which three people would you choose and why? Bram Stoker, Stephen King and Graham Masterton, because then I’d find out how I came into being and drink some of their muse just for a keepsake. Vampires leave their childhood behind as it will always remind them of frailty, but that said, I do remember dancing with Elizabeth Tudor before she needed the face paint, not bad actually. My first 19 years were spent slaughtering demons in the dark place, once released I learnt how to have such fun. Mozart was a particular favorite. He knew how to party. Well, vampires don’t actually work, we feed off the brilliance of others and that satisfies their existence, but my favorite muse would be in the arts, I do so love to see a naked canvas come alive. Slapping on the white, black nails, lips eyeliner and drink myself silly from as many sources as possible before sun up. Entwined with my true love. The moment the sun dips below the horizon. I cannot bring myself to say the T word. I guess trying to out-drink Errol Flynn and David Niven was a stupid mistake. Damn those 30s were so wild. A cat, they love the night and embrace nature with such freedom. Mevagissey at night, the lights shimmer across the harbor, clangs of bells, smell the sea. Invigorating. 5 gorgeous babes for my regular top ups. Yummy. I live with my wife, Shirlee Anne in a pretty coastal town in South Wales, UK. We both love Stephen King and had read many of his books and enjoyed their transition to the screen. Due to our love of books, my wife and I dabbled in writing for some years as a hobby. We were approached by a film company to write a paranormal TV series. We struggled most nights and all through weekends to come up with 22 episodes only for the company to go bust. Then after an accident at work, I was forced into early retirement due to disability. I used my newfound skills as a writer to help with my depression. We decided to use our TV series episodes as templates for film scripts and novels. My writing became more serious as certain A-list actors expressed interest in my scripts. 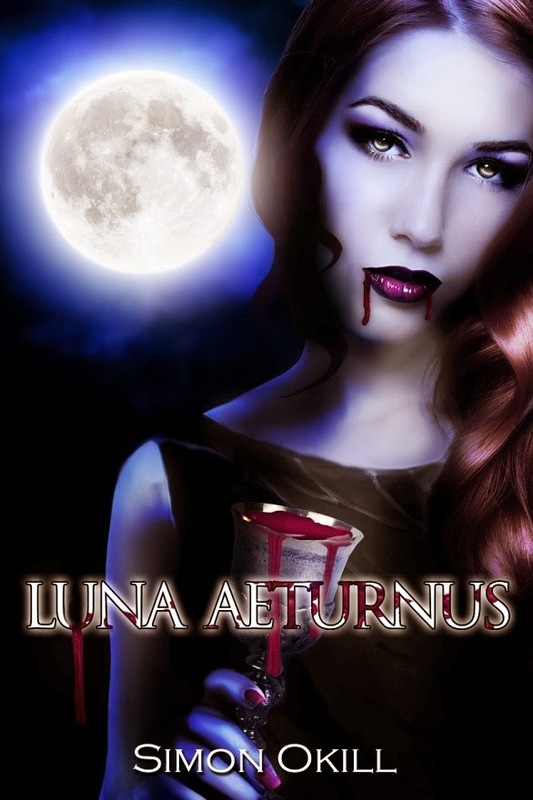 I now have 3 books published - Nobody Loves a Bigfoot Like a Bigfoot Babe - Luna Sanguis and Luna Aeturnus. It was a pleasure to have you! I love it when the authors let loose and have fun with the questions ;) Congrats on another great release! Brilliant job!! It was a pleasure to promote your awesome and beautiful blog. As always you blew my mind!! Well done and thank you for your hard work!! Natasha @Nat's Book Nook.